Tradition windows closely replicate the original windows of heritage homes! Tradition Windows — Looks old. Works new! Windows are one of the most important architectural elements of any structure. Change the window design or shape and you have lost much of the building’s original charm and character. That’s why our windows are custom made to look and feel like the ones your vintage building was built with. If you own a heritage home and are looking for replacement windows that closely replicate the originals, but feature up-to-date window technology, look into Tradition Windows! 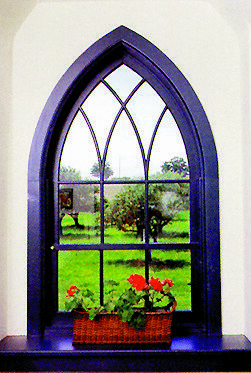 Download our “Colonial” windows spec sheet. Download our “La Province” windows spec sheet. NOTE: Some of the images on this page are artist renderings. Above: We can duplicate the “special” windows you need to replace. Below: Like the windows in this 1840’s century home? They’re Tradition Windows!